Beekeepers and farmers may be contacted through the end of January by the U.S. Department of Agriculture’s National Agricultural Statistics Service (NASS) to participate in surveys about the health of honey bee colonies around the country, honey production and stocks, and the cost to farmers of pollination services. Editor’s Note: It is varroa destructor, pathogens and disease, not neonics, that are responsible for bee health decline. It doesn’t matter. It’s now accepted that we’re about to run out of bees and that neonics are responsible. Except that none of this is true. Pollinators are important, but their numbers aren’t declining. 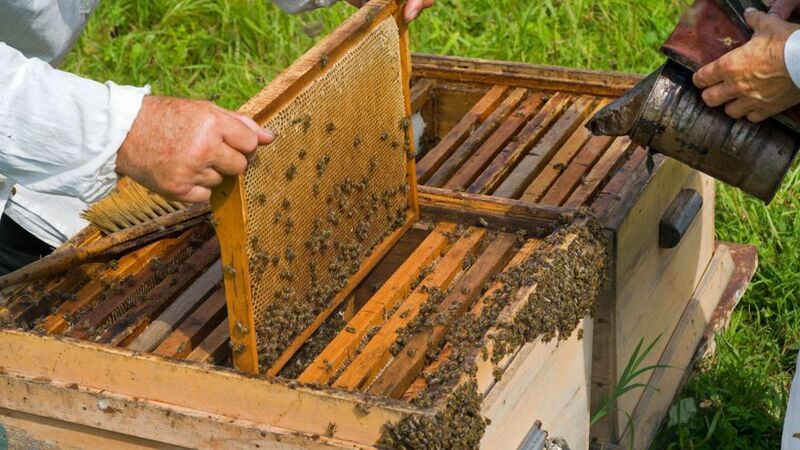 Honey bees are not natural to the United States; they are raised and moved around by beekeepers much like livestock. The quite predictable response by beekeepers to CCD has been to increase the number of hives. The total number of hives in the U.S. has actually been growing for several years, and in 2014, the number of bee hives reached the highest number in twenty years. Ron Hoskins is at the forefront in the fight against a parasite that’s causing a worldwide decline in bees. Sue Bradley meets him. A TINY parasite blamed for the deaths of billions of honeybees across the world has found its match in an 84-year-old great grandfather from Swindon. Editor’s Note: Translated via Google Translate. The original Spanish text is available here. The varroa mite that in the mid-80s caused the virtual disappearance of wild bee hives in the Iberian peninsula, is developing is inmunizando- He resistance to chemicals that are used to slow its effects among these insects, Basic for pollination of plants. Beekeepers fear meet next spring with losses of more than 30% of the cabin if the new systems being implemented on an experimental basis do not work this winter. In that case, the effects of immunization varroa not be only economic but also environmental. Why do honey bees survive Varroa infections in Tonga? Albert Einstein famously said “If the bee disappeared off the surface of the globe, then man would only have four years of life left. No more bees, no more pollination, no more plants, no more animals, no more man.” Nearly 50 years after his death, this quote is rising in popularity as environmentalists and the media deliver a gloomy message: the Western honeybee (Apis mellifera) is in decline. Despite the obvious hype, honeybees are indeed suffering from a myriad of ailments world wide. The most important culprit is the ectoparasitic mite Varroa destructor. This relatively new parasite is claimed to increase the virulence of honeybee RNA viruses, resulting in a change in viral landscape with devastating effects on honeybees. While this scenario seems plausible, direct evidence for a causal relationship between Varroa and virulence of RNA viruses is lacking. A provocative lead, but not true. Honey bees are in no doubt the most beneficial insects to humans due to their widespread use for pollination of our crops. In this paper we compare the recent investment into honey bee research in China and USA. We show that China has invested more heavily into honey bee research than USA since 2007. The recent funding increase promised by the White House Pollinator Task Force, hopefully, will reduce the funding gap between the two countries. Varroa mites are a major factor in honeybee decline. Untreated, they can destroy an entire colony of bees in just two years, and they also have the ability to build up resistance to synthetic miticides over time. Now, a study from Chinese university Xi’an Jiaotong-Liverpool shows real potential for a plant-based miticide that prevent mites from locating bee larvae and attaching to them. Surely East Sussex County Council is disregarding current scientific evidence and acting beyond the boundaries of its expertise in banning neonicotinoids on county council land? Its own officers recommended the motion by Councillor Ros St Pierre be rejected ‘because there is inconclusive evidence on the use of neonicotinoids’ (neonics). We await the results from detailed, landscape scale trials on neonics that are currently comparing treated and non-treated cropping areas and bee populations. Decisions should be based on sound science and a body of evidence that has been peer reviewed. The county council’s ban not only ignores the current evidence base – it pre-empts a decision from Europe and the results of these landscape scale trials. Because pollinator health, particularly of the honey bee, is so extremely important for agriculture, Entine said any decisions regarding neonics must be “science-driven” and not “activist-driven.” Specifically, he said, neonics have their place in the industry and a clear consensus exists that there is no honey bee crisis, though there is some concern about their overall health.